Arsenal manager Arsene Wenger is to stop attending football matches after yet again being unable to view the action on the pitch. Previously Mr Wenger had complained about the visibility at Arsenal's Emirates stadium but has now vowed to watch all matches, home and away, from the comfort of his own sofa. "I have been unable to see any of the action for years," said Wenger after Arsenal's goalless draw with London rivals Tottenham Hotspur. "The only action in the Spurs game was Emmanuel Eboue's sending off, and I couldn't see it because someone stood up in front of me." The diminutive Mr Wenger, 6ft 4in, said he has long struggled to see games, often missing the key moments involving his player's lack of discipline and has repeatedly asked for a booster cushion, or perhaps a step-ladder, to be installed in the Arsenal dugout. Arsenal said that they believed the long-standing issues of Mr Wenger being able to see anything that happens on the pitch had been solved by the design of the home dugout at their new Emirates stadium where, unlike Highbury, the manager’s seat faces the pitch. Although they conceded there was still the issue of the pillar that drops directly into Wenger’s eye line at the moment an Arsenal player pulls out a knife. "Every game is the same, it is getting embarrassing having to admit in interviews that I didn't see an incident involving one of my players trying to take an opponent's head off," said Mr Wenger. "However just at the crucial moment someone always stands in front of me, or the bloke with the big hat returns to his seat." 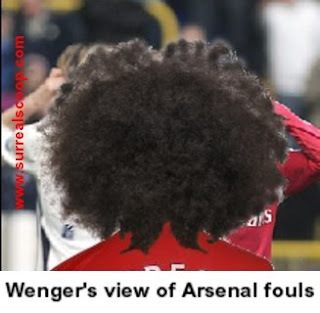 Mr Wenger said that it had happened so many times that people simply do not believe him any more when he says he didn’t see an incident and that the away match at Spurs was the last game he would be attending live. "People were barely hiding their laughter when I said that I hadn't seen the Eboue incident but it is true," said the Frenchman. "I couldn't believe it when the blimp landed on the touchline and the bloke with the big-afro hairdo got out and sat down in front of me. Again."